The CLP Regulation replaces all previous legislation on classification and labelling in the EU. The transition period ended on 1 June 2015! Make sure you do not use labels of expired legislation. Check valid pictograms from here. Let us take care of your safety data sheets, packaging compliances and labelling requirements! We will provide you with SDSs that are not only up to date and correct but also delight to look at, in the EU languages you need. We also translate SDSs to Russian, Turkish, Chinese and many more languages. We take care of up-dating your SDSs and make sure you and your customers have the latest versions at hand. 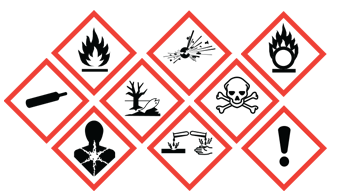 Check here more information about safety data sheets and labels. We will make sure you have all the necessary information on labels and packages. We will also advise on different options on labelling and classification. If necessary, we will help you modify and reformulate your product to “minimize” classification or to substitute troublesome or toxic components.